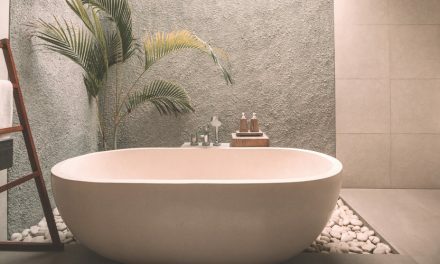 Replacing a bathtub surround isn’t at the top of everyone’s list, but sooner or later, you might have one that likely needs it. A well tiled shower wall can last 20 years or more, but a not-so awesome tile job can result in cracks, leakage, and mold. Choosing a bathtub surround that either you or a professional will replace isn’t that hard once you know the facts and can identify your priorities. A surround ranges from $50-$600 and often comes in three or five piece kits. 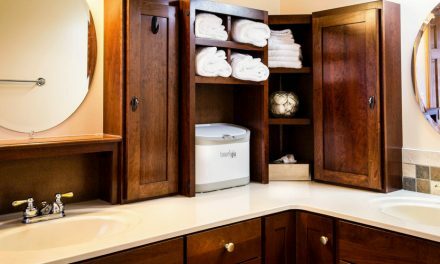 A solid surface surround or tile job ranges from $600-$2000, which points to why fiberglass, plastic, and acrylic surround kits are so popular. Material thickness directly correlates to cost, and a thicker surround is easier to install and lasts longer. On the high end, a premium composite or solid surface tub surround can cost upwards of $1000 and last 30 years. 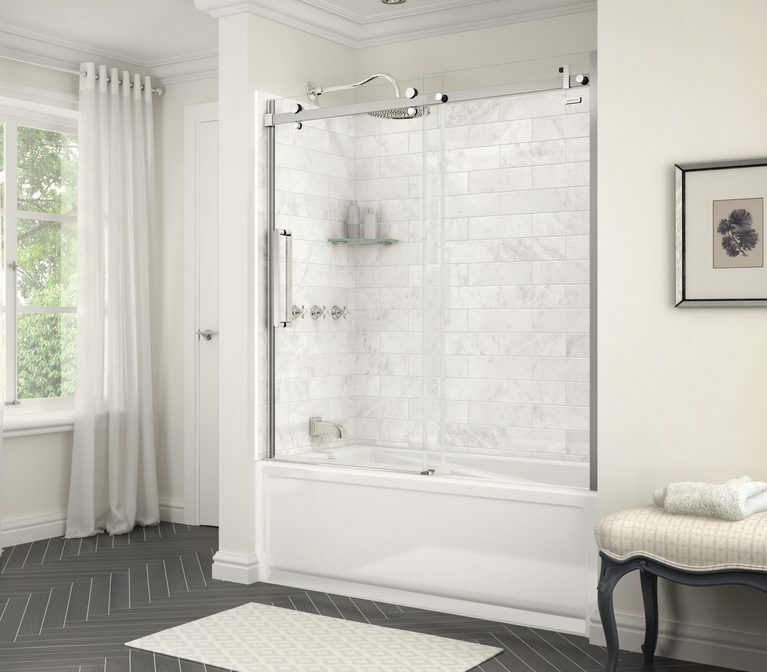 Most tub surrounds of these types offer realistic tile patterns, faux granite, marble, and include options for trim kits that eliminate the need for tile around the ends of the surround kit. Premium tub surround kits like these offer caulkless designs which lowers the necessary maintenance for water tightness. Kits in this category are also the strongest and least likely to chip or scratch. 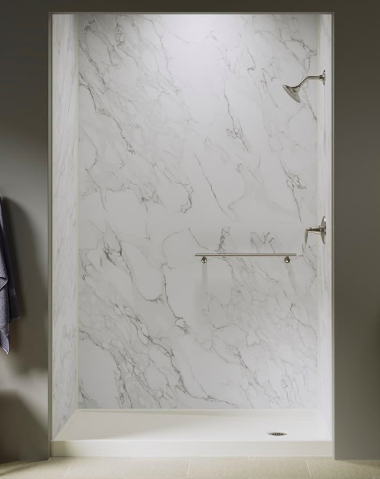 Solid surface and premium composite bathtub surround kits are harder to cut since they are thicker and harder than kits in other categories. Home centers don’t typically stock these and require special orders. Fiberglass and composites range from $300-$600. They are more chip-resistant than cheaper acrylic models and last longer. Most can be nailed or screwed in to the studs. Some mount with manufacturer provided clips. As you can see below, the higher end fiberglass and composite surrounds come with molded details or colors like the mock tile below. Because of the rigidity of the surface, corners are tighter and provide more room on composite tubs. Fiberglass is the opposite, so molded shelves are located on the back wall. Acrylic plastic surface surrounds range from $50-$300. The models vary widely in stiffness, but all have the same surface layer. Some of the cheapest models are designed to be glued directly to moisture resistant drywall. The more expensive models are stiffer with fiberglass reinforced shelves. These types of surrounds have the shortest life span, likely around 10 years, but they work for low-budget projects. Showers that aren’t used often can also do fine with a cheap surround. Acrylic bathtub surrounds are usually in stock at home improvement stores and are easy to cut and drill. Scratches and chips cannot be repaired, and this surface does scratch more easily than fiberglass and composites. A three piece bathtub surround is a a great choice for a plumb and square bathroom. Each piece can be cut to fit the three walls in the bathtub alcove and then secured to the wall according to the manufacturer’s directions (glue, screws, clips). The three seams are caulked to prevent water leakage. A five piece bathtub surround works well for walls that might be a bit crooked since they are more forgiving. The kit consists of three walls for the bathtub alcove and two corner pieces that are angled at ninety degrees. Like the three piece kit, you would install the pieces according to the manufacturer’s directions and then caulk all the seams. Tub surround kits that are mounted directly to studs are usually of higher quality and last longer than a kit that requires it to be glued on. A steamy bathroom is the enemy of glue. These types of surrounds are most used in new builds. 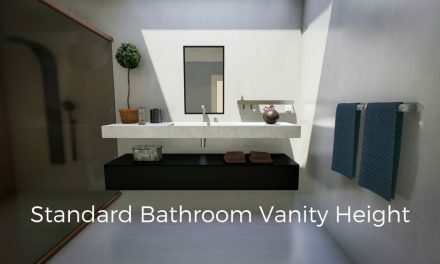 Maneuvering a solid one piece surround through doors, hallways, and in to a small bathroom can present a real challenge that is worth considering. The advantage is that the one piece tub surround kit is water-tightness. The only seam to caulk is the one where the tub meets the bottom of the surround. 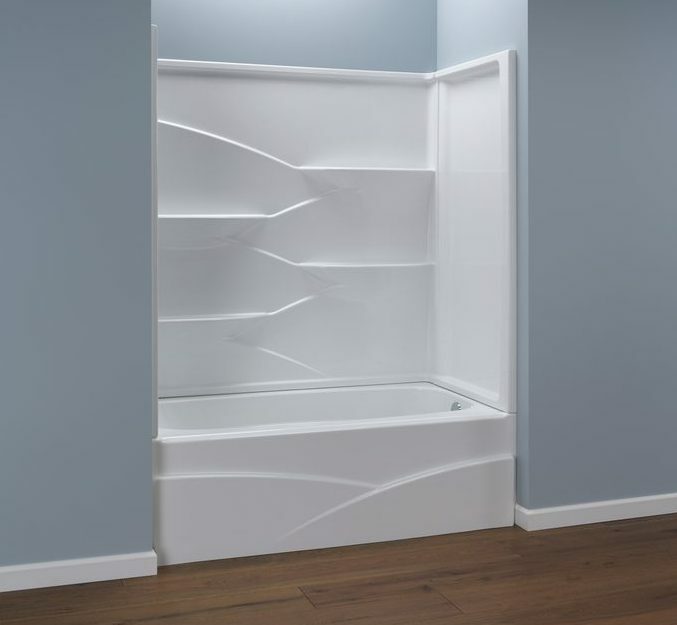 Most alcove tubs have a lip to prevent water from leaking out and damaging the wall behind it, so that seam is less concerning than wall seams. Another concern for one piece systems is the placement of plumbing. Examine the tub kit prior to purchasing to ensure it will work for your current plumbing set up. Before choosing a bathtub surround kit, be sure to measure your bathtub. Most tubs are 60 inches long, but width can vary. Bathtubs 30″ and 32″ wide are common, but get out your tape measure before purchasing. Most bathrooms have a consistent color throughout with matching tub, sink, and toilet. 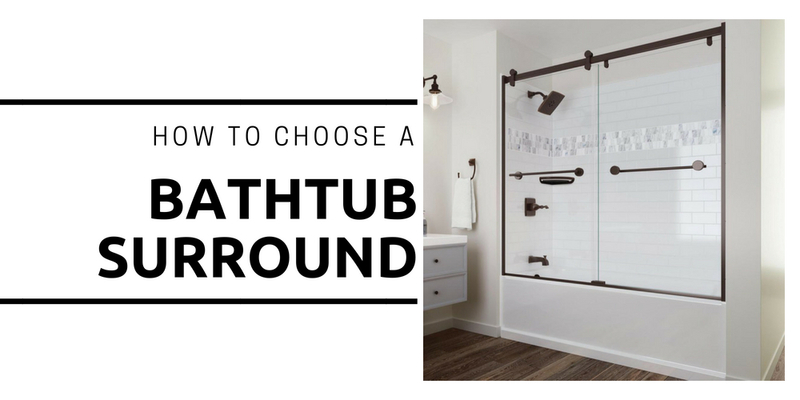 Pick a surround that matches your tub color to ensure that the bathroom looks well planned. A tub surround that’s a different color will draw the eye and highlight the difference in the age of the fixtures.